Saturday, June 20: Petitioner’s Training. Free training for volunteer petitioners, from 1 – 2 p.m. Saturday, June 20, in Rooms A-B on the fourth floor of the Ronald J. Norick Downtown Library, 300 Park Avenue, in Oklahoma City. Under the current law, we need to file 41,242 valid state petition signatures with the Oklahoma State Election Board to get a new party on the 2016 ballot. However, that number will change to 24,745 signatures when the new law goes into effect on November 1 of this year. IMPORTANT NOTE: Due to the inevitability of some signatures being invalid by the state election board (often because of a mistake in the signee’s residential address), we must set our goal at least 25% higher than the number required – about 30,000-35,000 signatures. 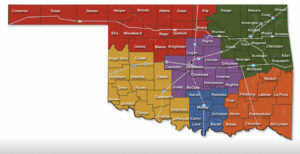 By law, petitioners must use the Oklahoma Election Board’s PETITION TO FORM A NEW PARTY. Click the link to download the PDF and print as many as you want. Next, find the line above “Name of Party” at the top-left corner of the page. Write the name of the party for which you are petitioning – Libertarian Party or Green Party. Next, find the adjacent line for “County.” Write the name of the county in which the voter is registered. NOTE: Make sure voters sign the form for the county in which they are registered to vote. It’s important that you confirm the signee’s residential address is the same as the one printed on her/his voter identification card (e.g. is the address where the signee lived when s/he registered to vote in Oklahoma). All signature pages must contain signatures of citizens from a single county. Write the name of the county on the blank line at the top of the form. Only people from that county may sign that form. If you have someone from a different county that wants to sign, start a new page. If the person signing does not know what county they live in, have them sign a blank form and then look up their county later and add it to the form. All columns of the petition line must be filled in correctly. Make sure they put their current full address and the proper date of their signature. People who sign the petition must be a registered voter. If they are not currently a registered voter, they can still sign, but they must file a proper voter registration that matches their signature before the petitions are filed. You may hold registration drives at the same time as filling petitions, meaning you can have people sign the petition and fill out the registration form at the same time. You must print your name and sign every petition page you fill out. You do not have to completely fill a petition sheet to turn it in. Just get as many signatures as you can. Be sure to remind those signing the petitions that they are only signing the petition to help the Libertarian Party and Green Party to gain recognition in Oklahoma. Signing the petition is not an endorsement of either party, their candidates, or platforms. Those signing the petition are doing so to give the parties fair representation in Oklahoma elections. For votes who are unfamiliar with the Libertarian Party of Oklahoma and/or the Green Party of Oklahoma, please refer them to oklahomalp.org and/or okgreens.org. For the national parties, see LP.org and GP.org. All petition pages must be completed properly and submitted to the Oklahoma Election Board no later than March 1, 2016. We ask that you give us your signature pages no later than mid February 2016 so that we can properly package and submit all of our petitions at the same time. When you are ready to turn-in your petition sheets, you may bring them to any official Libertarian Party , Green Party or OBAR meeting or event, and give them to any of the officers of the state parties or to an OBAR representative. We will have addresses available soon, for those whom wish to mail their petitions to us. If you have any questions about how a signature might be considered invalid, please reference this instruction sheet from the Oklahoma State Election Board. Below is a visual map, labeled by county, for those who prefer a visual guide while petitioning. We have til March 15th to file so by the 14th we could use 35,000 signatures! You can print the form from here. You can bring them to events, network with Libertarians and double your impact while getting to know some really good people. I wish i weren’t in FL right now, but if back in time would love to help. I’d be happy to post where petitioners will be and facilitate in whatever ways i can. I know one of our GP members has an awesome canopy which might help in some of the elements. Who all is working on this and how can we jumpstart or boost efforts?